Food or cooking related social networks aren’t new, but social recipe community SweetFry believes it can offer a difference for amateur cooks, bakers, chefs and even wine and beer makers. 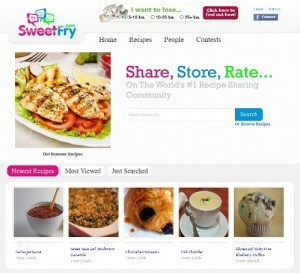 SweetFry is essentially a recipe-sharing community where users can store and share their favorite recipes, as well and rate and try thousands of unique recipes from around the world. They can also follow and befriend other users based on food and drink preferences. By tapping on the phenomenon of crowdsourcing, the site can help inspire the minds and taste buds of creative home chefs and expand its recipe database. “Crowdsourcing allows us to tap into the huge amount of great recipes stored in boxes, folders, and minds around the world,” explains founder and CEO Jason Harvey. But it’s not just about sourcing content from the crowd. Harvey says that he plans to use crowdsourcing for other functions in his business. In fact, the company leveraged on crowdsourcing services RocketHub for funding, 99designs for its logo, and Serv.io for its press releases. “Using crowdsourcing for business development allows SweetFry to compete with much larger organizations,” Harvey insists.